Places where I would like to be – Yosemite and the Canadian Rockies! Some friends’ recent holiday to the Canadian Rockies and our trip a few years ago to Yosemite have inspired me to try to paint a few mountain scenes. 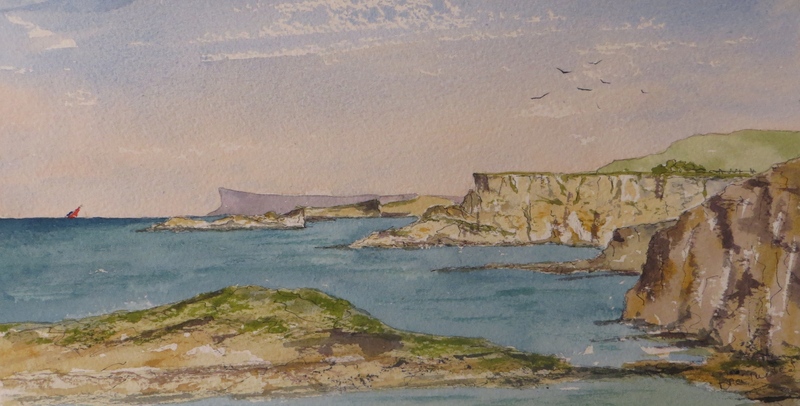 Using their, and my own photos, from these trips here are just 3 watercolours of those places. I hope you enjoy this short post , I found producing these paintings a lot of fun, and maybe a visit one day? Lets hope so. El Capitan in Yosemite National Park. 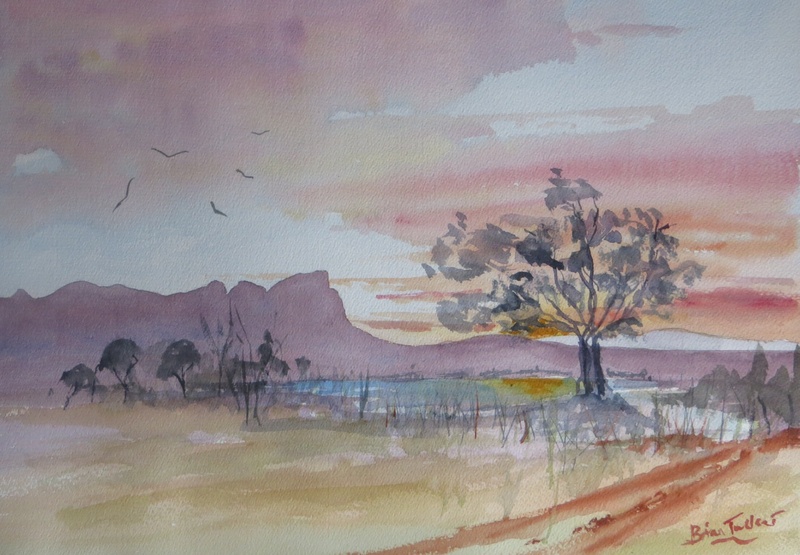 Watercolour 14 inches by 10. Sunset at Lake Moraine in the Canadian Rockies. Watercolour 16 by 12 inches. Lake Louise in the Canadian Rockies. 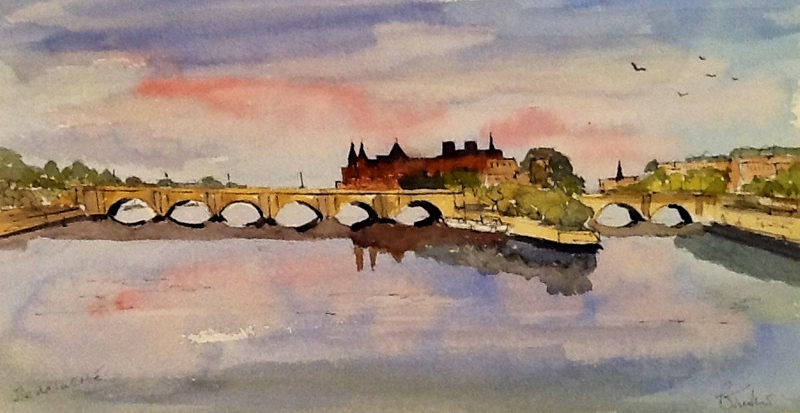 Watercolour 13 inches by 9. The past couple of weeks there have, as always, been great and warm enough to sit outside on our terrace and eat our breakfasts and lunches. How nice to do this in April! 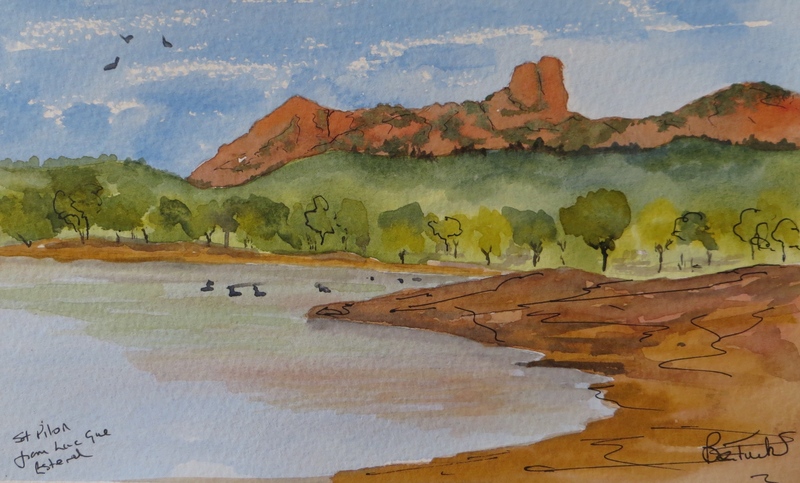 Visits there always give me some time for painting watercolours, either on the spot,or from new photos from our daily jaunts or from reference photos from the past few years. 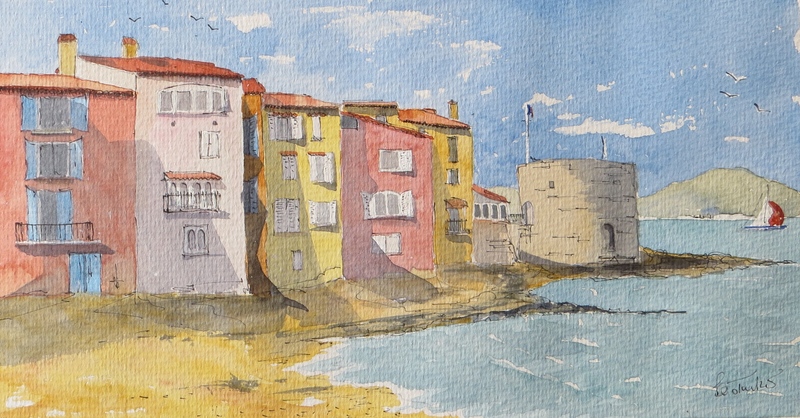 This holiday was no exception and so here are the paintings that I managed to do on this trip. 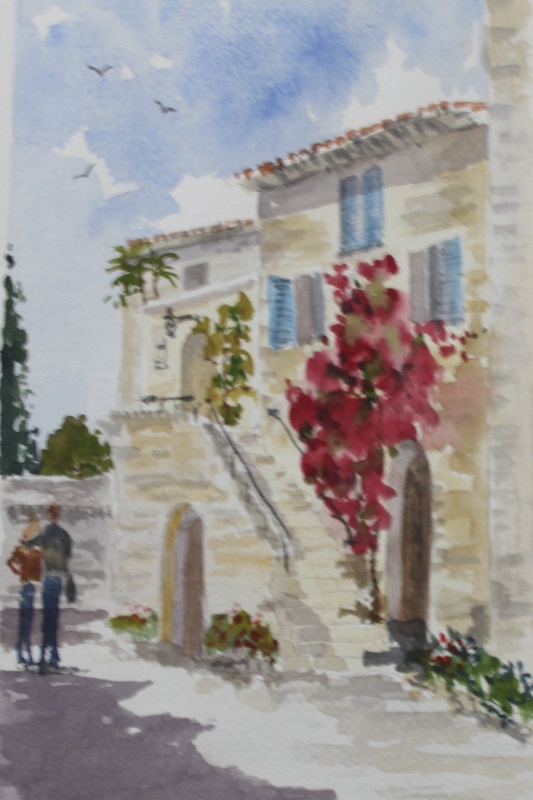 Nearby to us is the hill top town of Cagnes and close by is the former home of Pierre-Auguste Renoir. Renoir lived and worked there in the 19th and 20th centuries until his death in 1919. It is lovely place to visit and there is real sense of his love of the house and it’s gardens and views. There are number of his paintings and sculptures on display and many photos too. 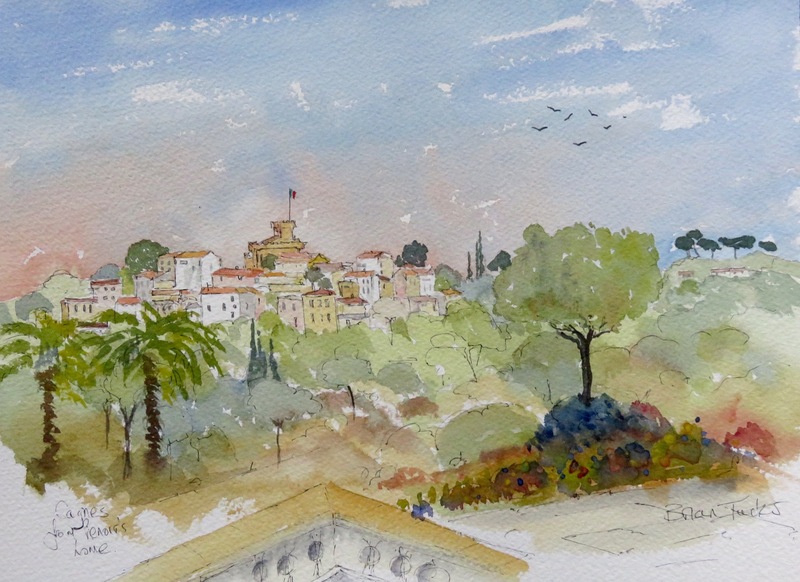 This painting is the view from the bedroom of Alice Renoir, his wife, looking across to Cagnes. 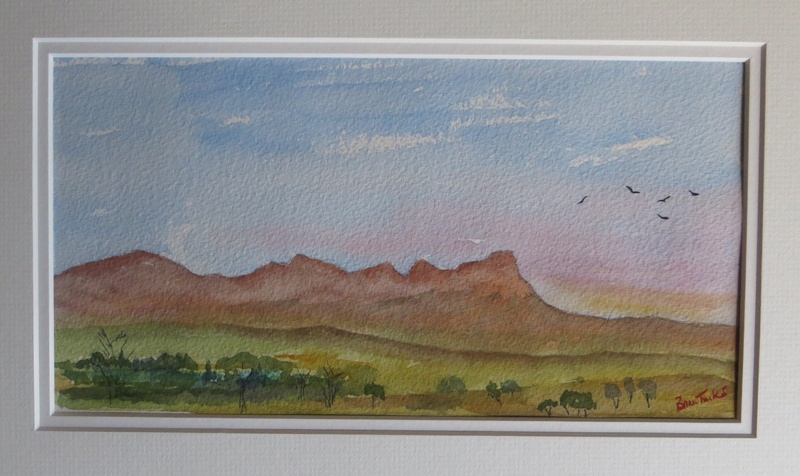 This watercolour is 14″ by 10″ on Arches rough paper. All these paintings are this size as I use an Arches glued edge pad when travelling mostly. 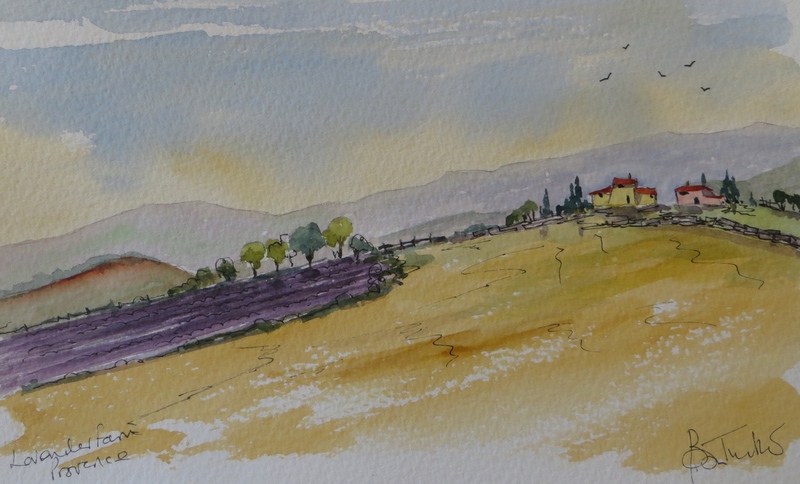 As we travel into the hills and mountains of Provence there are many rural scenes that I love to paint. 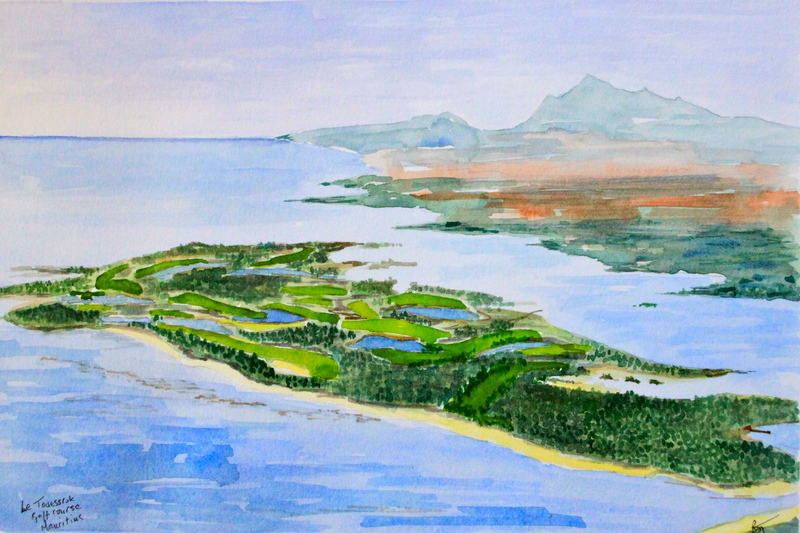 Usually they are a mixture of reality and composites of several photos and these two watercolours fall into that category. 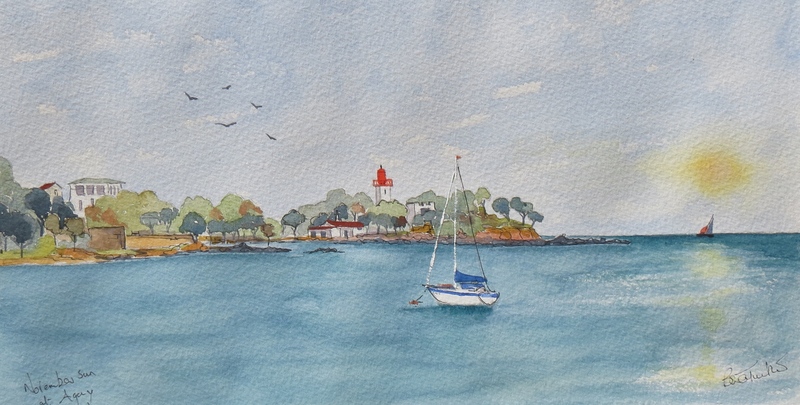 Really nearby us is the seaside town of Mandelieu – La Napoule. It has large marina with many yachts and boats moored there of all sizes. 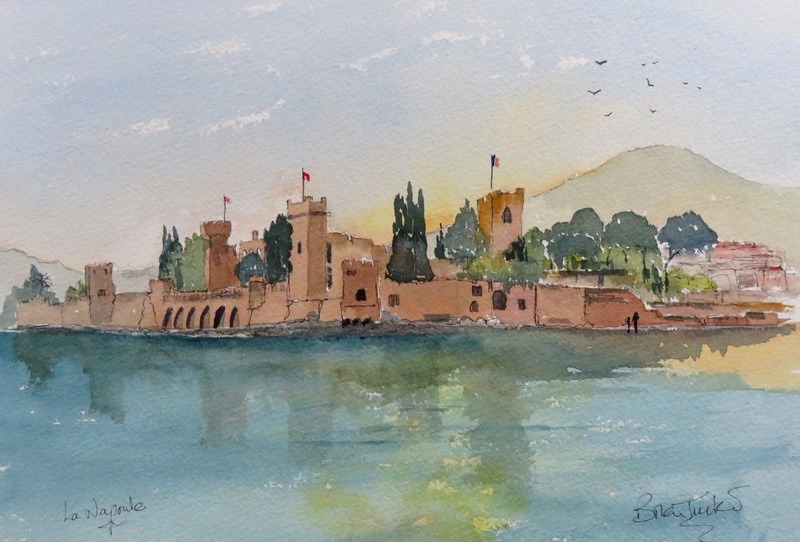 From the marina there is a good view of The Castle, which today is an art gallery and a nice place to visit. 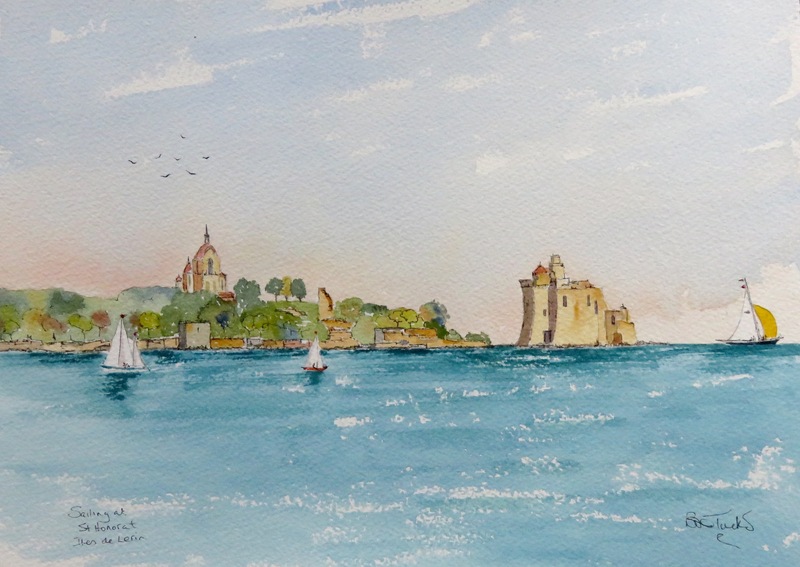 From nearby Theoule there are fine views across to Cannes and the Iles de Lerin. 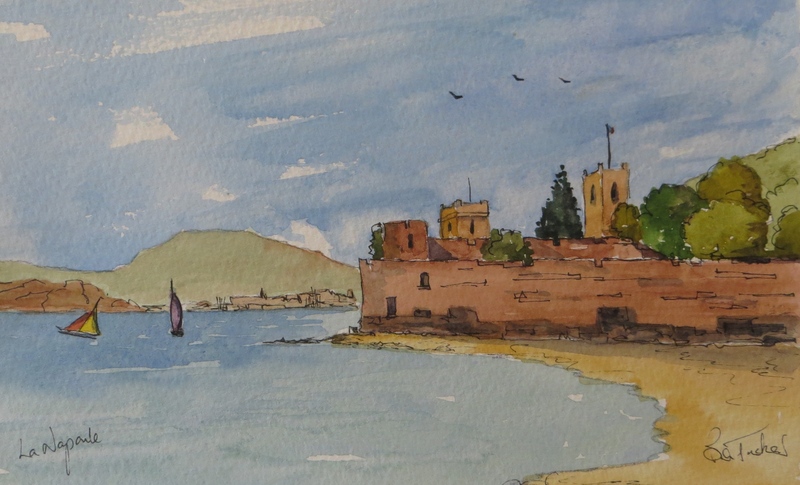 The second of these, St Honorat is seen in this painting , painted from a zoomed photo of the island, taken from Theoule. 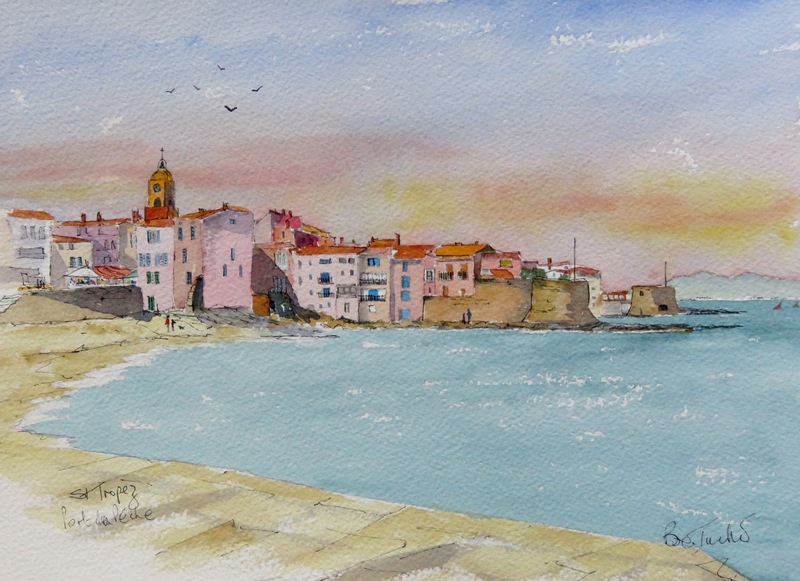 Further East of Cannes is Antibes. 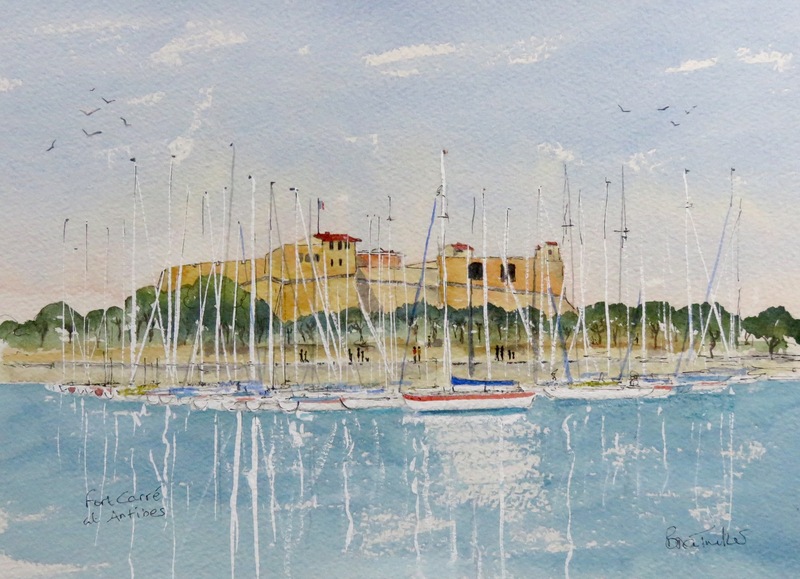 I love to paint at Antibes and this particular painting is of the large Fortress which guards the harbour, Fort Carré, with some of the many moored yachts in the harbour. 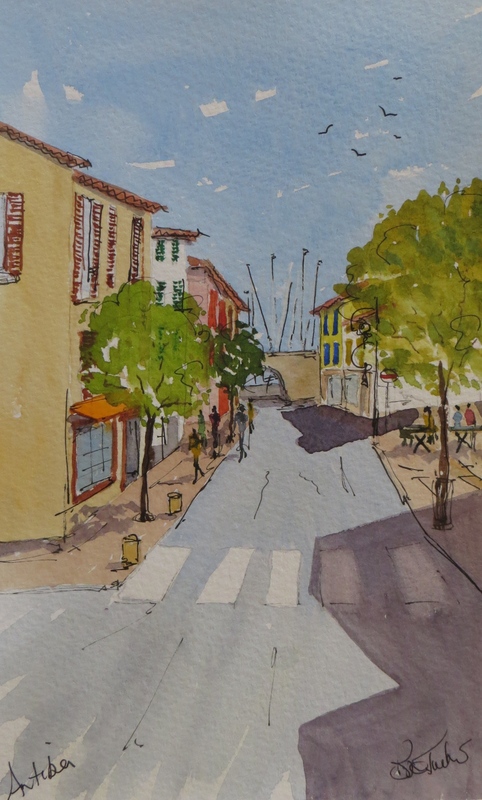 Its seems that we often take the ferry from St Maxime to St Tropez for lunch, and a wander round the old part of the town. 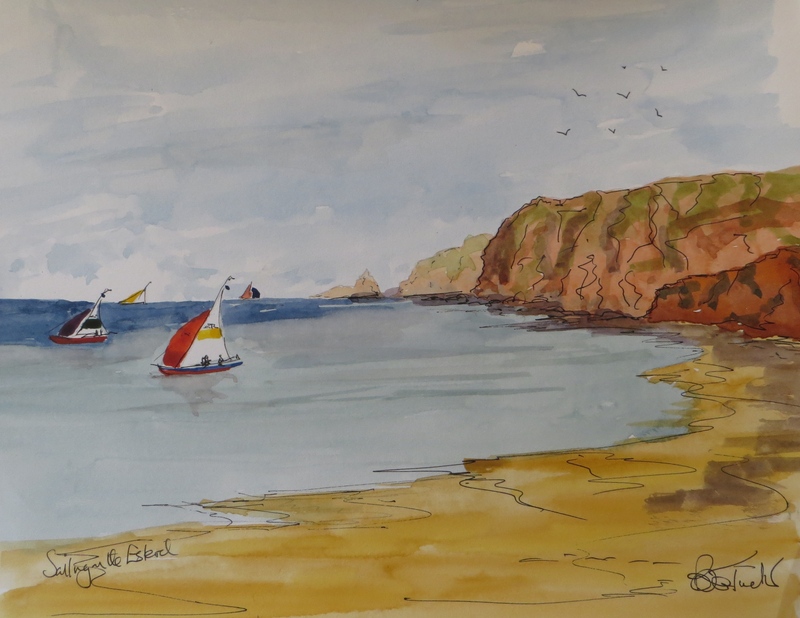 I love to paint the small unspoilt harbour at le Ponche, Port de Pêche, and our recent trip was no exception to this. So here is another view of Port de Pêche, just a few minutes walk from the bustling and glitzy harbour on the main front at St Tropez. 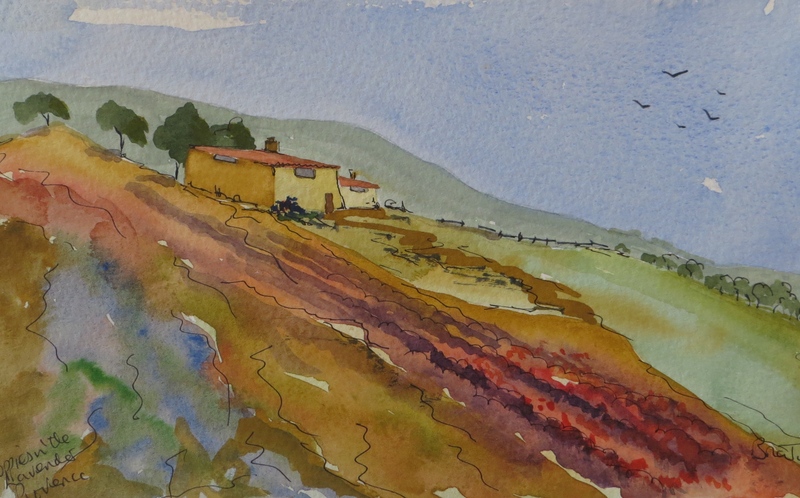 I hope you enjoy these paintings from the land of warm sun and beautiful scenery, it is such a nice place to be! A Few Days in The Sun! 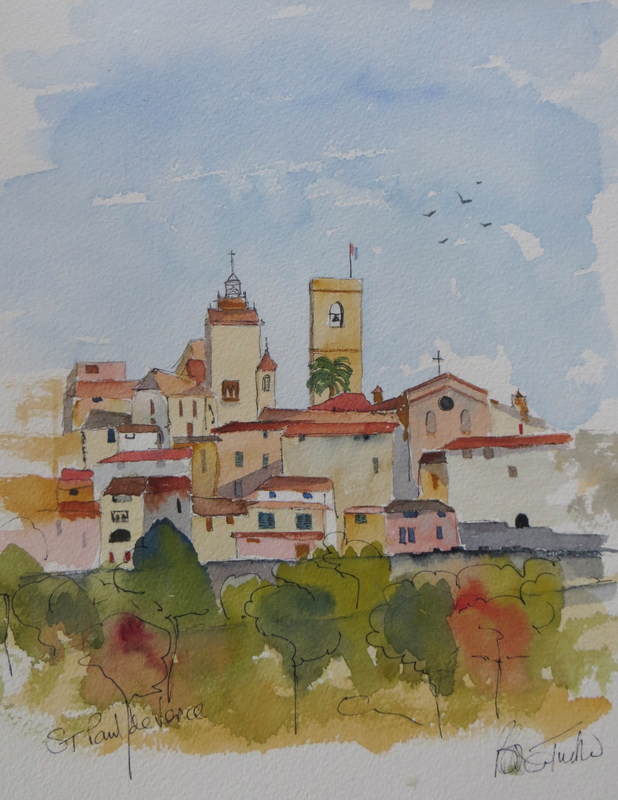 I think by now everyone must know how much we like the South of France, especially the Cote d’Azur. At the end of November we were able to spend some time there and for the most part the weather was really lovely, warm enough to eat breakfast and lunch outside on the terrace and at the harbour at Villefranche. Now back in England the weather is cold and wet and so a little reminder seems in order. 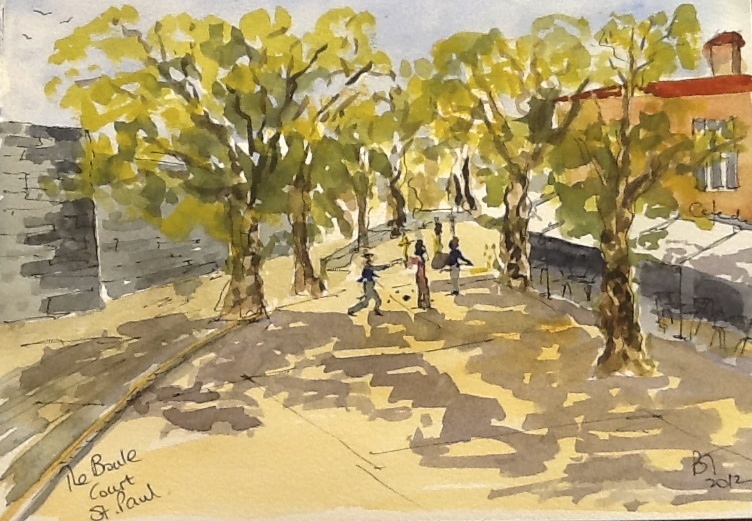 I wasn’t too happy with my quick watercolours but as the sun was out I thought I would share them with you. If it is sunny where you are then that is very nice but if it is wet, cold or snowy then imagine the warm sun and look forward to next summer. 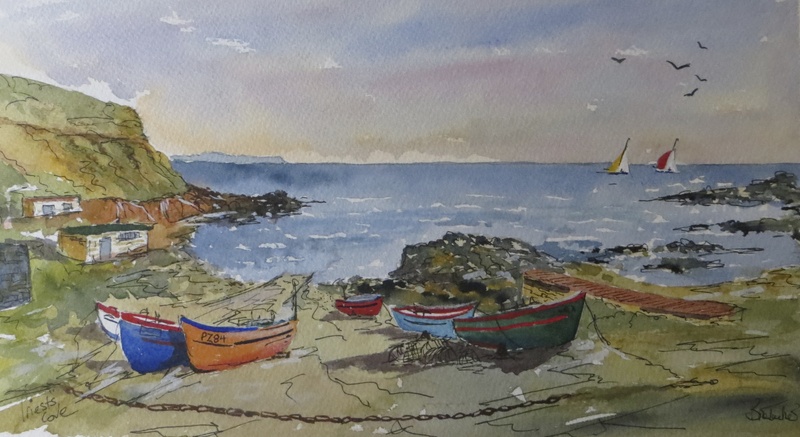 Agay on the Esterel Coast in November afternoon sun. Antibes in November, blue sky and snow on the mountains. At last I have decided to open a personal website where my paintings can be viewed and purchased. I have been thinking about it for some time but only now have I got organised enough to have the site set up. 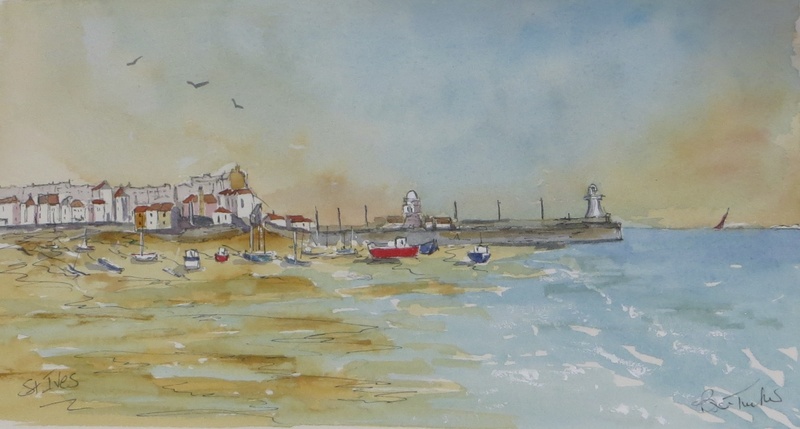 This past year I have sold a few paintings and received a few commissions for paintings of customer’s favourite scenes. 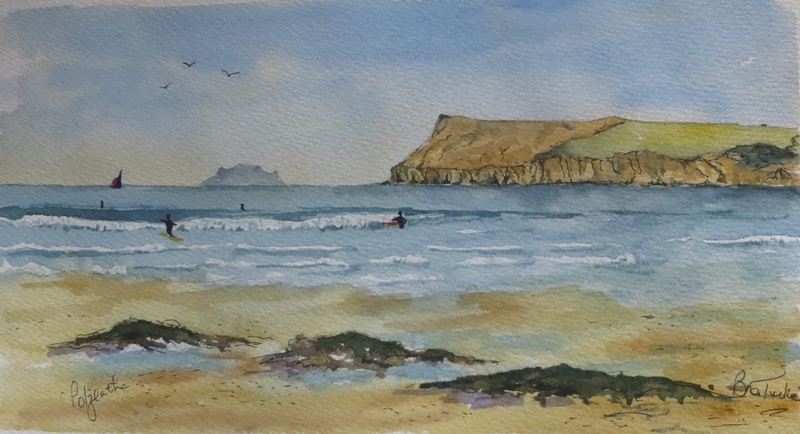 So the new site brings together these two aims, one to paint watercolours for people of places they have visited, and secondly to display a number of artworks that can be purchased from me of places that I have visited and painted watercolours of. I hope you will enjoy looking at it as well as continuing to look at this blog which of course will continue! I really do appreciate all the support from friends,followers and readers alike and I hope you will enjoy both sites in the future. 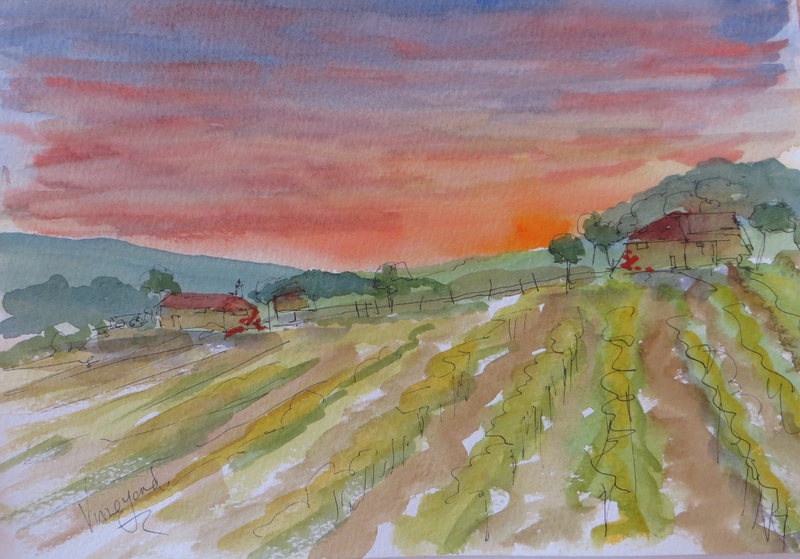 Happy travelling, photographing and painting! There are some places that we never tire of visiting. 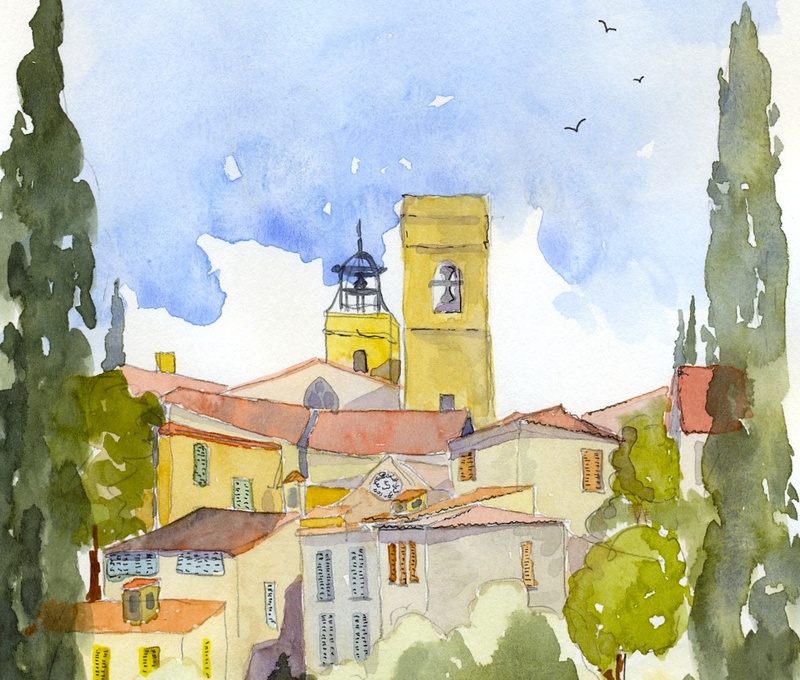 For us Saint Paul de Vence is one of them. Alas it is so popular that it is often teeming with visitors, but at the right time of day the lovely little streets and the town can be enjoyed to it’s full. The views of the town as you approach it are lovely too and and each time I visit there seems a new aspect to paint a watercolour of. 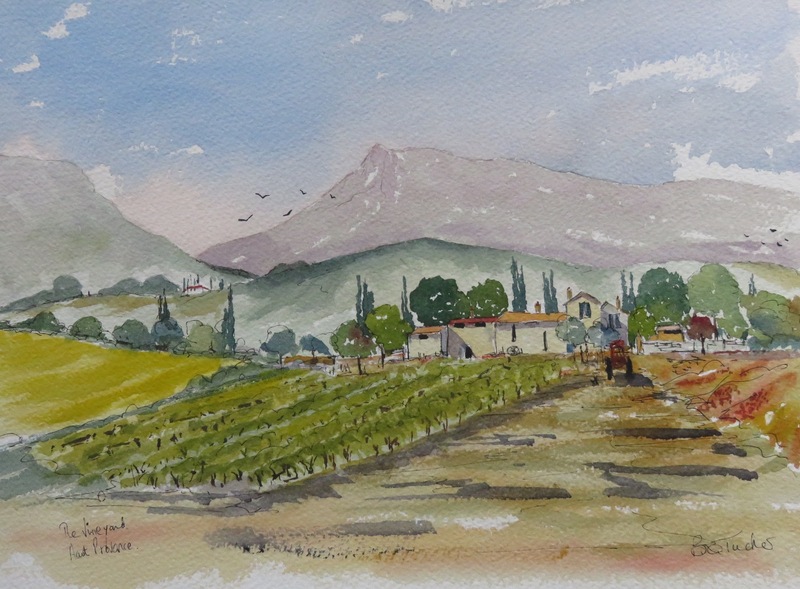 This visit was no exception so I thought I would look back through previous paintings and gather them together in the blog post dedicated to the town. Recently a new creperie has opened near to the Church in the town and I can really recommend it. The best crepes that I have ever eaten, prepared in the Normandy way. If you are there, try one, they are delicious! St Paul is also full of art galleries and shops with items to tempt the tourist as you would expect but somehow they add something to the town and a extra dimension to the lovely architecture and the narrow streets. 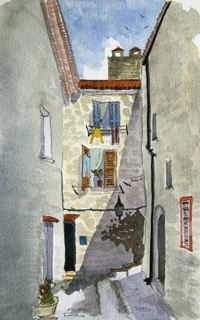 Nearby too is the bigger town of Vence , which has a very nice old town to discover too. There are so many lovely places in this beautiful, and our favourite, part of France. 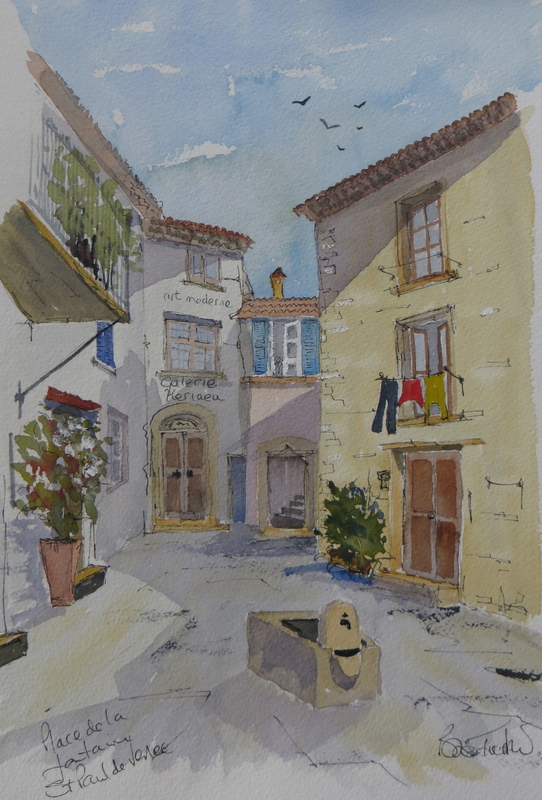 I hope you will enjoy these paintings of the town and if you haven’t visited St Paul then do so one day. Crowds or not you will enjoy it. 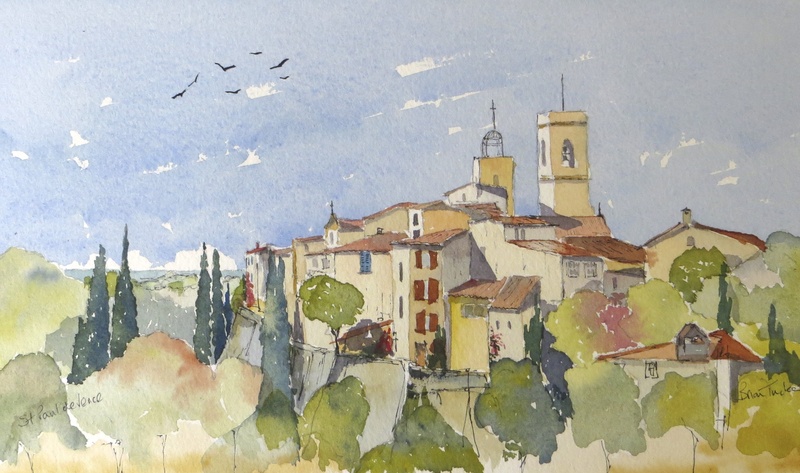 St Paul de Vence, another day, another painting! We always seem to be on the go and last week we enjoyed a lovely visit to Northern Ireland, for many reasons one of our favourite places in the World. It wouldn’t have been authentic if the sun had shone every day , but in mixed weather the countywide was beautiful and we managed to tour around, visit friends and family and also visit both familiar and new destinations. Some of these were the locations of scenes from the very popular TV series Game of Thrones. So this post features some places that can be seen in the series. These are my interpretations of the scenes, and of course are not as accurate as photos but they are all original! We stayed in delightful new cottage/apartment in Holywood (http://www.holywoodhill.com), which we would also strongly recommend if you are planning visit to Northern Ireland. Holywood is a nice small town only a few miles from Belfast with galleries,cafes,restaurants and shops and makes a good base to get around the Province. 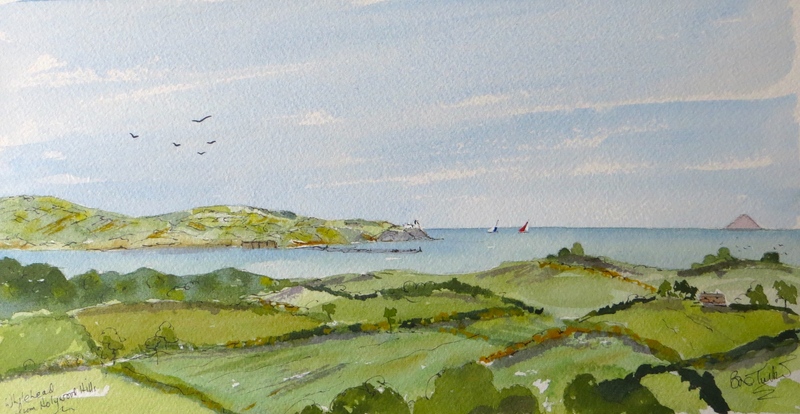 Whitehead seen from Holywood Hills Cottages. Co Down. Eventually I will update my guide book to Ulster with these destinations but for now I hope you enjoy seeing them in the blog, together with one or two other places that we visited . Happy travelling and enjoy the Summer, if it ever reappears! 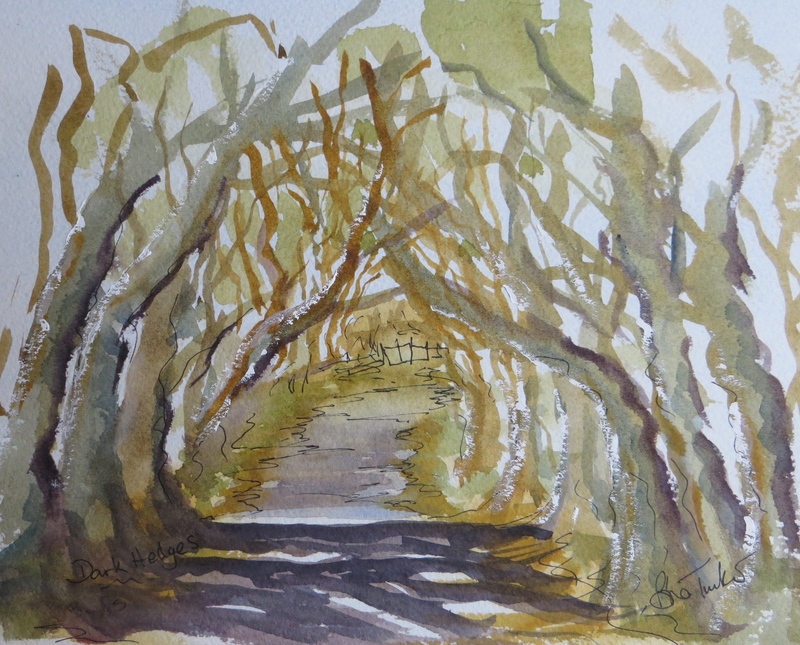 The Dark Hedges near Armoy. 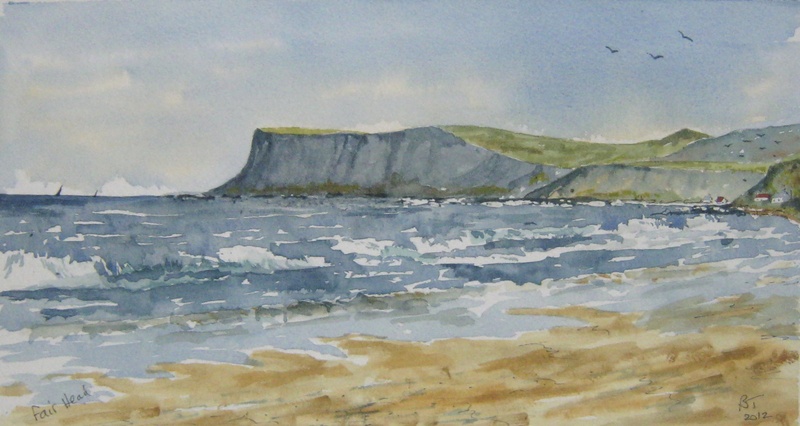 Co Antrim. 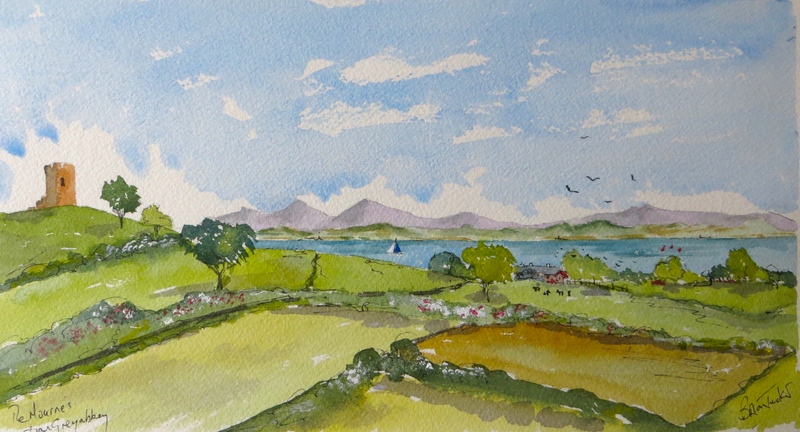 Strangford Lough and the Mourne Mountains from Greyabbey. Co Down. 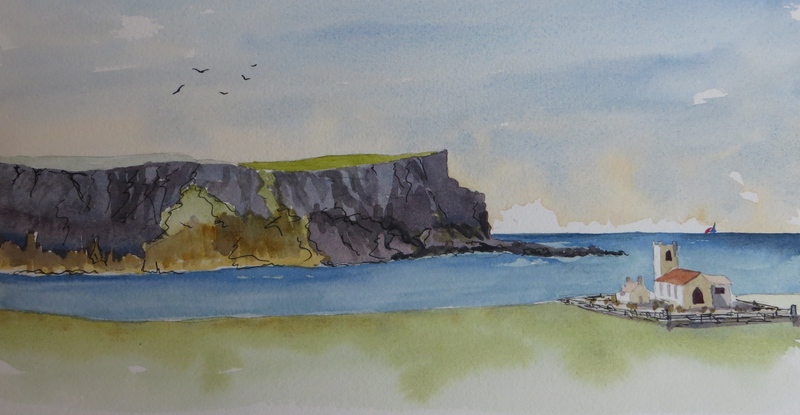 Fair Head seen from Ballycastle. Co Antrim. How nice it is to see the sun on daily basis. That was how our week this May was back at our favourite haunt of the Cote d’Azur! Not very hot but lovely and dry with the sun breaking through nearly all day. 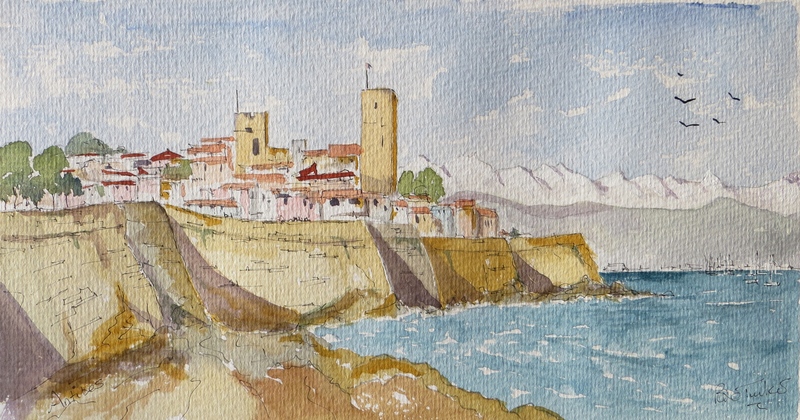 The combination of scenery, the beautiful Esterel Coast, and the mountains of Provence make this a wonderful part of the world. We even ventured into Cannes where the mayhem of the preparations for the Cannes Film Festival were well underway, but nobody asked for our autogragh! We weren’t sorry to be leaving before the Festival started but just a short way from Cannes calm reigns and the roads are peacefulful and beautiful in all directions. Even time for some quick sketches for future, hopefully larger, paintings. 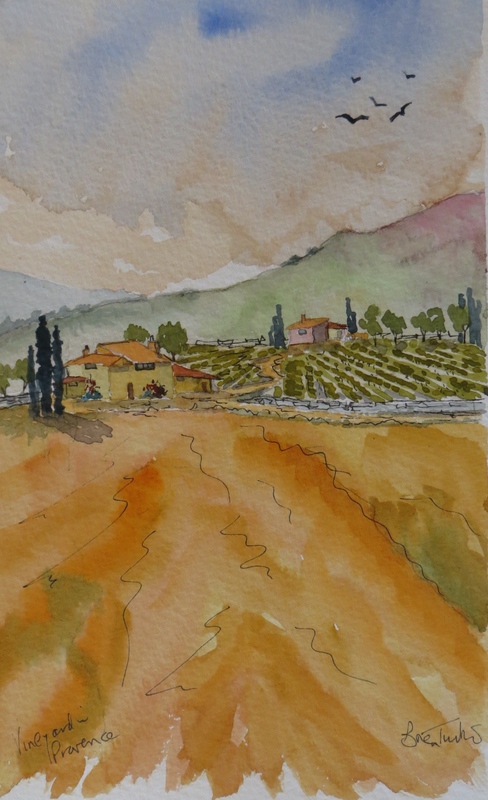 These watercolours are all just 8 by 5 inches in size and quickly painted after taking some photos, or recalling previous Provence scenery. I hope you enjoy them as much as I have in painting them. If you have read the guide books on another page of this blog you will know that we are very familiar with this enchanting part of France. The local wines, predominantly Rose but also some light and fruity Reds are a great complement to some really good restaurants, some of which we visited again on this trip. If you are ever in Fayence do go to Table d’Yves , one of the finest restaurants we have found in this part of the region. Happy travelling and if the sun is out where you are enjoy that too! At last the sun is out! This winter it seemed as if the rain would never stop, then late last week and since the weather in the South of England has really improved and the sun has been shining. It inspired me to get out and go to the Weald of Kent and there, near Horsmonden Church your will find this Springtime scene. I hope you like my interpretation of it! The Church dedicated to St Margaret is about 2 miles from the Village centre. This is attributed to the centre of the village moving in the 17th Century to where a foundry had been established by John Browne. It was a large employer and the village thus migrated to be nearer the foundry. The foundry closed in 1685, but the village has remained at the Heath. The term Weald is an old English word for Forest as this area was once heavily forested, even today there are many fine woods and copses across the area. Anyway I hope wherever you are the weather is fine, we certainly hope it stays fine here and everywhere will get a chance to recover from all that winter rain. Recently we were able to spend a long weekend in Cornwall, firstly with some good friends in Rock, and then at a lovely hotel at Carbis Bay near St Ives. 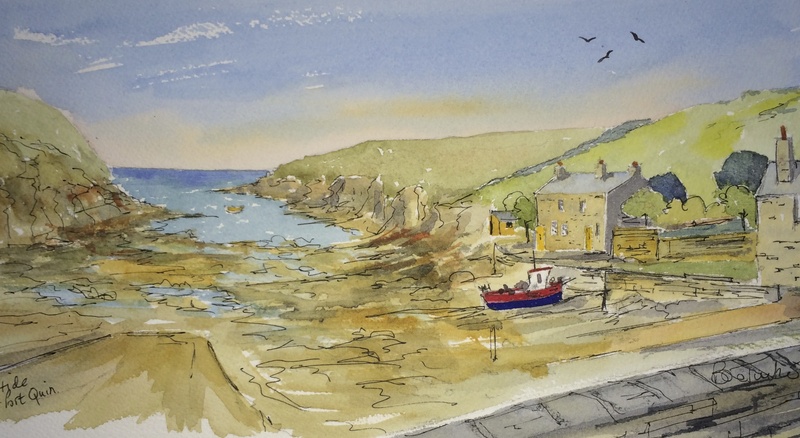 Cornwall has the loveliest coast and wonderful little harbours and towns dotted along the spectacular cliffs and bays. There wasn’t much time to paint but here are the few that I managed to get done both during and since the visit. You could spend a lifetime exploring the coast of Cornwall, so these few days were great reminder of holidays of many years ago, and an opportunity to enjoy our friends’ company and eat some great food. If you are going to St Ives do look up the Boskerris Hotel, really very nice indeed. From a genuine Rick Stein Cornish pasty in Padstow to exceptional food at Nathan Outlaw’s restaurant in Rock this was very enjoyable weekend, and we were fairly lucky with the weather too! 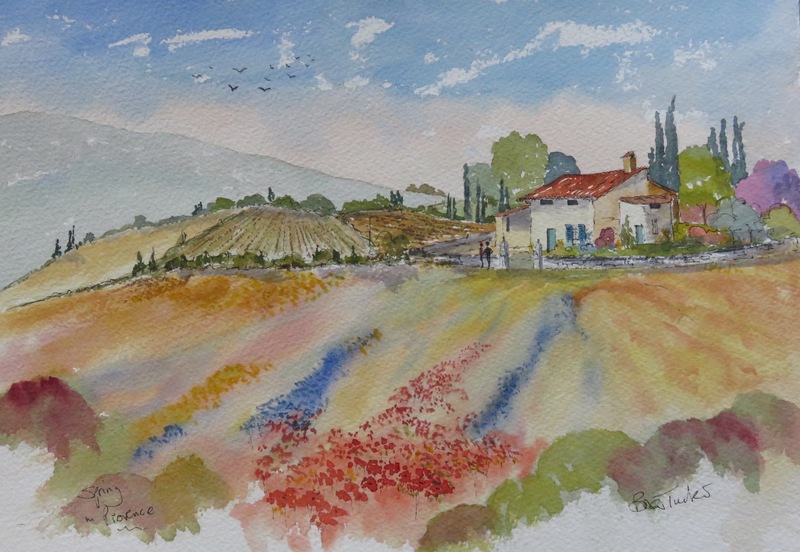 I hope you too like these paintings of the area. 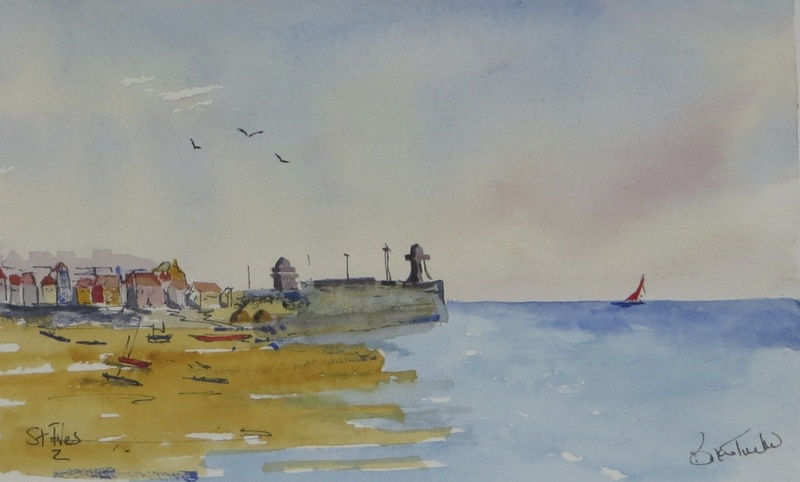 I don’t think I can quite get to the standard of the galleries in St Ives but painting these watercolours was great fun.